A comprehensive analysis of the growth of research activity has been conducted in the field of “Engineering” originating from Arab countries. A bibliometric analysis based on database Scopus was carried out to follow research activities in this field. Both quantitative and qualitative perceptions were taken into consideration. It is a fruitful and an informative study for scholars in disciplines related to engineering. A total of 6,399 documents were published from Arab world. The highest number of articles associated with "engineering" was from Egypt (29.1%), followed by Saudi Arabia (17.3%). The maximum number of citations was 371 for an Egyptian research paper. The most productive journal was AEJ Alexandria Engineering Journal. 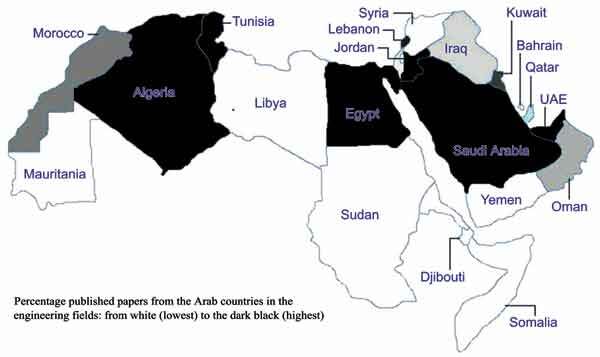 The study identified 2,730 (42.7%) papers with Arab-foreign country collaborations. The most productive institution was King Fahd University of Petroleum and Minerals, Saudi Arabia. This study will improve the understanding of research trends in disciplines related to engineering. The research trends should be focused and oriented toward serving the development and industries in Arab countries. The authors declare that these results are up to the date of 2012, may be some researchers have more publications but did not appear in the search because not all journals are included in Scopus and some others, and even included in the database, some of its volumes are not included yet. Arab world, Bibliometric, Engineering, Scopus.